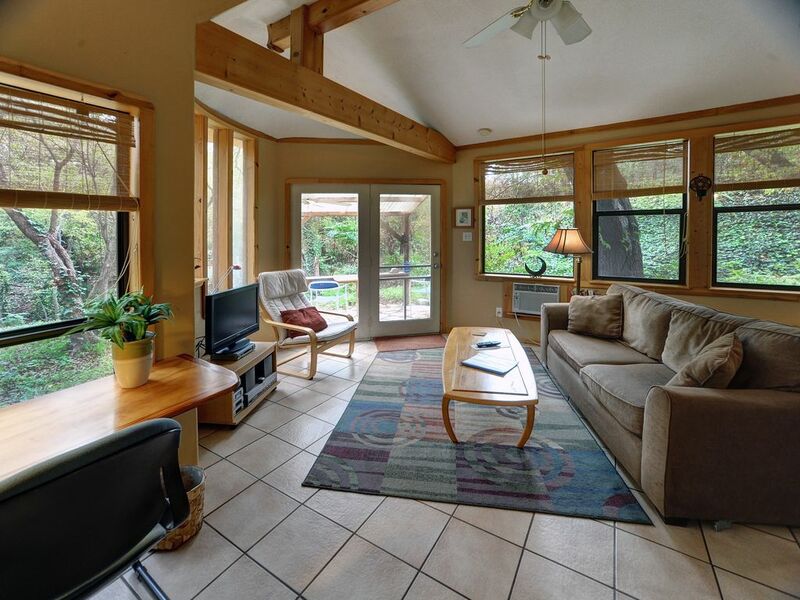 The Forest Retreat: Minutes to SOCO & center yet nestled in the quiet forest. This craftsman-designed home is located across the river from downtown Austin on a beautiful wooded lot in one of Austin's most desirable neighborhoods, Travis Heights. Walk or bike to major parks, great restaurants in the SoCo District, or even downtown to the fun sixth street music district. We are close to everything yet you feel like you are living in the country. The house was designed, built and decorated by the owner artists Wolf Sittler and Charlotte Bell. This non-smoking home has sunny rooms, a well appointed kitchen, a patio and lots of windows looking out onto the backyard forest greenbelt. The house has one bedroom with 100% cotton sheets. The kitchen have all amenities including a stove, coffee maker, refrigerator and much more. Our newest accommodation is the Tree-cycle which is a tiny house which can be added on for extra guests. Search for char wolf ventures for the website. For reservations for less than 30 days there will be a 15% hotel tax additional fee to pay once you have reserved. The feel of the country but are within minutes of the city center and 15 minutes to the Austin Bergstrom airport. Wolf Sittler and Charlotte Bell are both artists. Wolf, a furniture maker, has added details through out the houses. Spalted pecan kitchen cabinets and hand made wood furniture add charm and warmth. Charlotte's photographs grace the walls. The house has all the touches that artists provide plus a well stocked kitchen. They also have a home in San Miguel de Allende listed on VRBO. Austin is the most interesting and young cities in Texas filled with outdoor activities and festivals. The restaurants and shops, near the house, are extra ordinary. In 3 blocks you are on the hike and bike trail with miles of lovely paths. You will be close to everything. The house is in a quiet wooded location but you are minutes from I35 which will take you to the lakes or to the airport. But most people do not travel further than a few minutes from the house since so much is available in the area near downtown. There are bikes to use as well as a washer and dryer. 4 chairs and round table. Peaceful retreat but close enough to downtown and SoCo activity. Charlotte was a great host, responsive and little plumbing issue was quickly resolved. Cute little house in tranquil surroundings. It met our needs perfectly. Quiet comfortable cabin nestled in the forest. Location was perfect for our stay in Austin. Out of the downtown area, but close to everything we came to see. Lots of great music venues just a short Uber ride away. Would definitely stay here again when we return to Austin. Glad you enjoyed our "cabin" in the city. Great and affordable. Happy making. Beautiful setting. Quiet in the midst of the city. Comfortable with hosts who really are there should any problem develop. Thank you. This was a welcome and unique response. I know there are many places where you are left in the lurch should a problem arise. Our stay was very enjoyable. Your kindness is truly appreciated. I would highly recommend staying here. Quaint and quiet. Nice place. We are 9 blocks from the popular SOCO district with fabulous restaurants and fun Shopping. 3 blocks from the River hike and bike trail. 6 blocks to the Rainy street area. Basically we are close to everything.